AC Transit has installed solar panels on the roofs of its Hayward and Oakland-Seminary Divisions. These PV systems deliver a significant portion of the power required to operate each facility during the day. 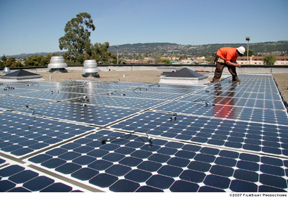 You may download pictures from our solar photogallery. AC Transit has installed exhaust-after-treatment traps in all of its older buses. These traps not only cut particulate pollution by 85%; they also reduce nitrogen oxide emissions by an additional 25-30% and hydrocarbons and carbon monoxide by up to 90%. This program has helped AC Transit achieve a 95% reduction in particulate matter over the last ten years. 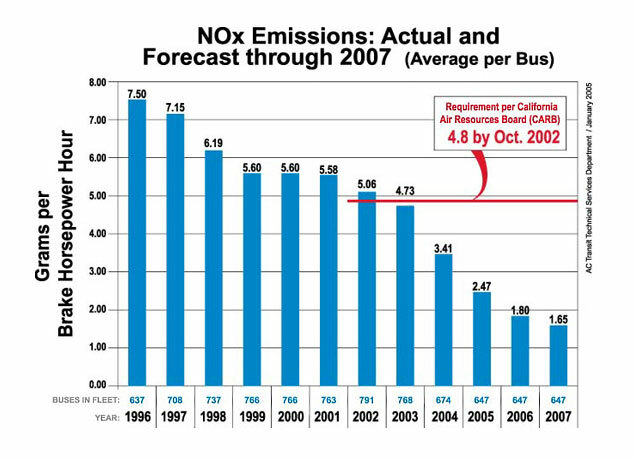 In 2002, AC Transit switched to an ultra-low sulfur fuel (15 ppm). 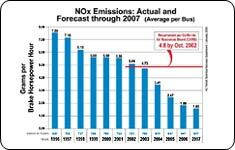 According to the California Air Resources Board, this shift, along with improved exhaust after-treatment, results in a 76% average reduction in hydrocarbon emissions, a 29% average reduction in carbon monoxide emissions, and a 29% average reduction in particulate matter emissions. In October 2007, we launched a new program to test two potentially even cleaner fuels: Biodiesel and GTL (Gas-to-Liquids) Diesel. Learn more about the Cleaner Fuels Test Program. AC Transit’s HyRoad Program aims to demonstrate to the world the viability of an emission-free transit fleet. Three state-of-the-art, zero-emission, hydrogen fuel cell buses operate from AC Transit’s East Oakland Division. The addition of at least five new generation fuel cell hybrid buses, featuring lighter and more compact components, a new body/chassis design that reduces overall weight by at least several thousand pounds, and enhanced on-the-road performance. This expansion of hydrogen facilities and buses is part of a Bay Area regional zero-emission bus advanced demonstration program mandated by the California Air Resources Board.